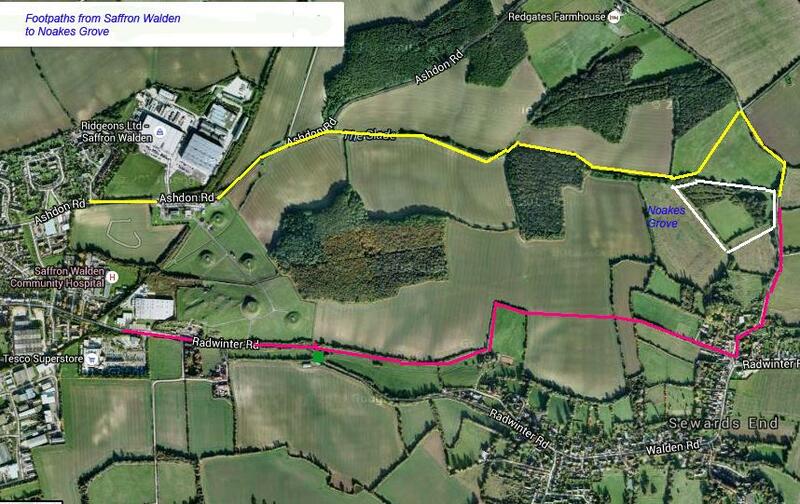 A nature reserve close to Sewards End, The yellow “P” on the map marks the gated (not locked) entrance to car park. 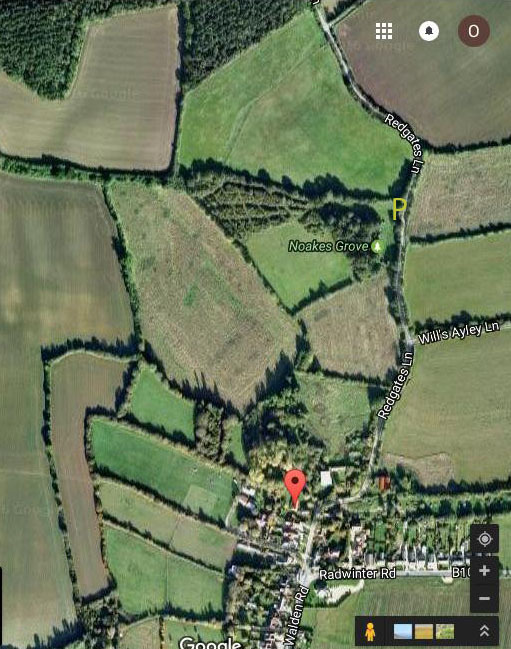 The red marker shows where “CB10 2LW” will get you using a satnav. Then go north on Redgates Lane. We raise sheep and lambs in the meadow. As well as the meadow we have a small ancient woodland, a rough flower-rich field and an area of thorn scrub criss-crossed with grassy rides that possess a marvellous array of wild flowers, including several rarities. It is a truly beautiful place. The public are welcome visit Noakes Grove at any time, on foot and with well-behaved children and dogs. There is a Forest School for very young children, occasional open days to study the wildlife and regular work parties for those willing help manage the nature reserve. Full details on the www.organic-countryside.co.uk website. Visiting Noakes Grove is free, but maintaining Noakes Grove (just to pay the insurance and tree surgery costs for example) costs a lot. If you enjoy visiting Noakes Grove, please become a “Friend of Noakes Grove” for a donation of £5.00 per year per household. You can join online at www.organic-countryside.co.uk. We’ll keep you informed (by email) of special events and when any of our produce (lamb, apple juice) is available for purchase. We will be planting hedgerow saplings and opening up the rides through the scrub area. Suitable clothing, hand tools, if you have them, and a packed lunch. There will be a big fire so foil wrapped potatoes for baking could make a welcome addition for lunch, we will provide hot drinks. It is very important to bring some good gloves for handling blackthorn and hawthorn that we will fell and burn. Light refreshments available (hot or cold drinks & cakes) or try a campfire-cooked sausage and nettle lunch.